Improving access to safe water in slums is really complex and challenging. Transition Management theory embraces that complexity to find radically new and collaborative ways of using and managing urban groundwater. What social, technical and political changes are needed to make the shift towards sustainable urban groundwater management in Sub-Saharan Africa – and how can those changes be achieved? From 2010 to 2050, the urban population in Sub-Saharan Africa is expected to almost quadruple from 300 million to over 1 billion people. Most of the urban growth will take place in rapidly expanding slums. In those areas, groundwater is used, but groundwater of good and safe quality is scarce. Also, there are few or no institutions effectively concerned with managing urban groundwater reserves. In such a complex social, institutional, and environmental system, radical changes are required to move away from non-existent or unsustainable practices towards sustainable urban groundwater management, which takes the interests of slum dwellers into consideration. These radical changes are characterized by social learning of urban frontrunners, based on solid information, integration of ideas, and systemic thinking. 1. What are the relationships (over time and within a defined area) between above-ground and below-ground systems? This includes developing a detailed understanding of the geology and movement of water, pollutants, viruses and pathogens; the social and political power dynamics of who is “in control” of the slum; the financial and economic costs and benefits of using groundwater; how has the situation evolved over time and to what extent have the changes below and above the ground influenced each other? 2. How applicable is Transition Management to slum areas in Sub-Saharan Africa, and how can it be tailored and improved? This includes testing the Transition Management Cycle (see Figure) in a number of slums. Key components of the TMC are the establishment of multi-stakeholder platforms or social learning alliances, shared strategic planning, and small scale demonstrations to show the promise in making the transition towards sustainable groundwater management. Sustainable groundwater management should be thought of as a journey of discovery rather than a fixed goal that can be worked towards. 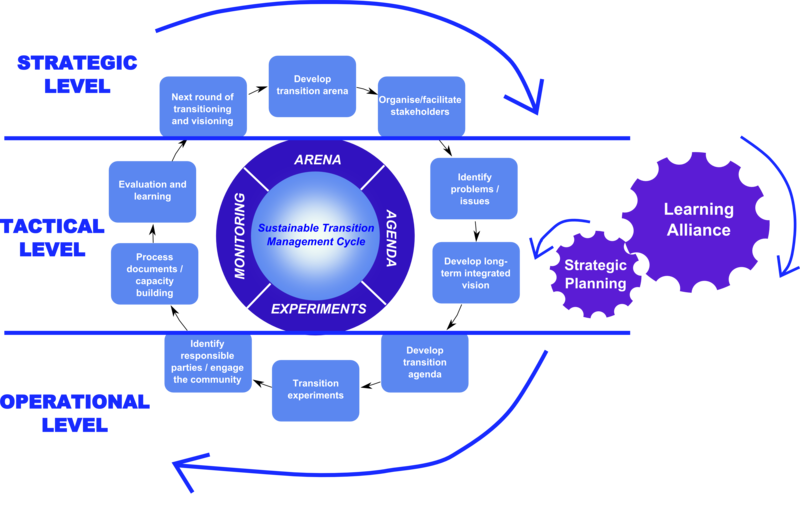 Transition Management Cycle (TMC) involves long-term planning through small steps based on learning and experimenting. Lund University Centre for Sustainability Studies (LUCSUS; Sweden). Nyenje, P.M., Foppen, Uhlenbrook, S. and Lutterodt, G., 2015. Using hydro-chemical tracers to assess impacts of unsewered urban catchments on hydrochemistry and nutrients in groundwater. Hydrological processes., Vol. 28, Pp 5860-5878, DOI: 1002/hyp.10070. Nyenje, P.M., Havik, J.C.N., Foppen, J.W., Muwanga, A. and Kulabako, R., 2014. Understanding the fate of sanitation-related nutrients in a shallow sandy aquifer below an urban slum area.Journal of Contaminant Hydrology, Volume 164, Pp. 259-274, DOI: 1016/j.jconhyd.2014.06.011. Lutterodt, G. S., Foppen, J.W. and S. Uhlenbrook, 2014. Escherichia colistrains harvested from springs in Kampala, Uganda: cell characterization and transport in saturated porous media.Hydrological Processes 28, Pages 1973–1988 (2014), DOI: 10.1002/hyp.9733. Katukiza, A.Y., Temanu H., Chung J.W., Foppen, J.W.A., Lens P.N.L., 2013. Genomic copy concentrations of selected waterborne viruses in a slum environment in Kampala, Uganda. Journal of Water and Health, DOI:2166/wh.2013.184. Nyenje, P.M., Foppen, J.W., Uhlenbrook, S., Kulabako, R and Muwanga, A., 2013. Nutrient pollution in shallow aquifers underlying pit latrines and domestic solid waste dumps in urban slums. Journal of Environment Management 122, 15 June 2013, Pages 15–24, DOI:10.1016/j.jenvman.2013.02.040. Lutterodt, G., Foppen, J.W., and S. Uhlenbrook, 2012. Transport of Escherichia colistrains isolated from natural spring water. Contam. Hydrol. 140-141 (2012) 12–20, DOI: 10.1016/j.jconhyd.2012.08.011. Foppen J.W.A., Lutterodt G., Roling W., and Uhlenbrook S., 2010. Towards understanding inter-strain attachment variations of Escherichia coli during transport in saturated quartz sand. Water Research 44 (2010) 1202 – 1212, DOI: 1016/j.watres.2009.08.034.